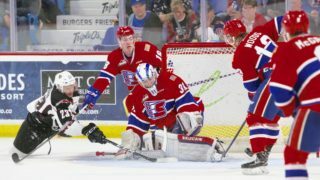 SPOKANE, Wash. — The Spokane Chiefs used a balanced attack to cruise to a 8-3 win over the Tri-City Americans on Saturday night at Spokane Arena. Fifteen different Chiefs recorded at least a point, including goals by eight different players. An action-packed first period featured 29 combined shots and three Chiefs scores, including a pair of goals by Luc Smith and Cordel Larson that were scored just 20 seconds apart. Spokane’s Eli Zummack and Tri-City’s Riley Sawchuk each added a marker as well. The first of four second-period goals for Spokane came at the 6:42 mark when King sniped home his first as a Chief on a breakaway to extend the lead. 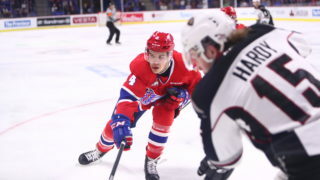 Making his Western Hockey League debut, forward Kaden Hanas picked up an assist on the King goal, marking his first career WHL point, giving Spokane the 4-1 lead. Following goals by Adam Beckman and Nolan Reid, Jake McGrew found the net at 19:35 to extend his goal streak to six games. The San Jose Sharks prospect now has 10 goals scored in his last nine games. 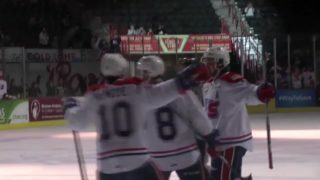 Holding a 7-2 lead heading into the final period, Spokane’s Riley Woods and Tri-City’s Parker AuCoin traded goals as the Chiefs went on to claim the 8-3 victory. 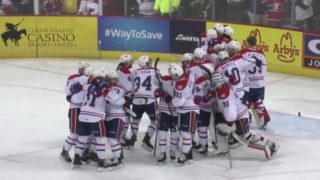 Spokane dominated shots on goal throughout the game, finishing the night with 48 to Tri-City’s 26. 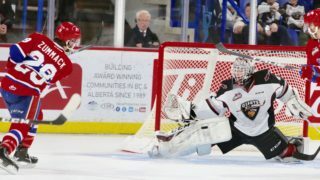 Spokane’s Bailey Brkin was 23-for-26 in goal for the Chiefs while Talyn Boyko was 40-for-48 for Tri-City. The Chiefs finished 2-for-3 on the power play and 2-for-2 on the penalty kill. The Chiefs are back at it on Friday, January 18 when they host the Vancouver Giants on Coeur d’Alene Casino Night. Fans will be entered to win prizes throughout the game courtesy of Coeur d’Alene Casino! Some restrictions apply. It will also be another Fred Meyer Family Pack Friday, with Fred Meyer rewards card members eligible to purchase a Fred Meyer Family Pack for (ticket to the game, hot dogs, and Coca-Cola product) for just $15/person! 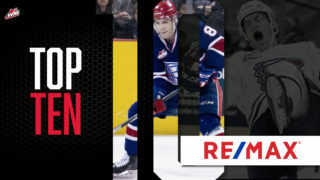 Tickets for all Chiefs home games are available online, in-person at the Chiefs’ Ticket Office and over the phone at 509-535-PUCK.